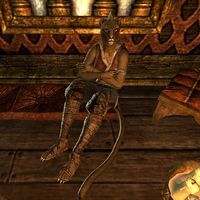 Adabibi is a Khajiit patron of the Five Claws inn in Woodhearth. She is busy relaxing and won't talk to you. This page was last modified on 22 October 2017, at 09:59.